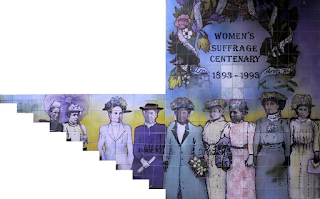 The Women’s Suffrage mural in Khartoum Place celebrates suffragettes who fought for women’s franchise in New Zealand – which they won in 1893, and women in this country became the first in the world to gain the vote. Artists Claudia Pond Eyley and Jan Morrison designed the 2,000 bright tiles of the mural marking the centenary of this achievement. A Navy band led over 300 guests down Queen Street for the 1993 opening, and the Air Force hung a cargo parachute across Khartoum Place which dropped at the exact dramatic moment for the unveiling by Irish President Mary Robinson and Governor-General Dame Catherine Tizard. Ref: Auckland Council, Khartoum Place pre-1993. Ref: Auckland Council, Khartoum Place, 2011. 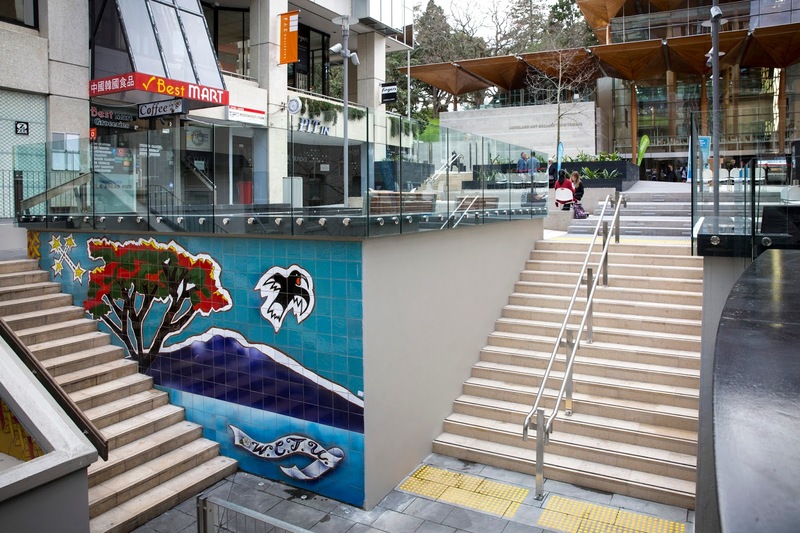 There were also calls for the mural to be relocated to various locations around the city including being moved to a reservoir wall in Ponsonby Road, or next to the White House brothel at the entrance to Myers Park. The Onehunga community offered the mural a home because of the suburb’s rich suffrage history – Elizabeth Yates became the first female mayor in the then British Empire in 1894 and she is one of the suffragettes depicted in the mural, along with Amey Daldy, Anne Ward, Lizzie Frost, Matilda Allsopp, Annie Jane Schnackenberg, Fanny Brown and Ida Wells. Ref: Auckland Council, Suffragette mural, 2011. 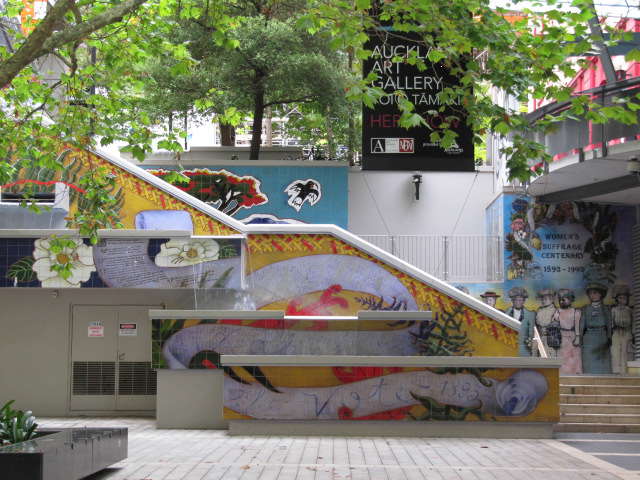 Margaret Wilson, a National Council of Women’s Auckland executive member, was appalled that the memorial might be “bowled for the sake of a staircase” and the group presented a 4,300 signature petition from those wanting the memorial to stay. 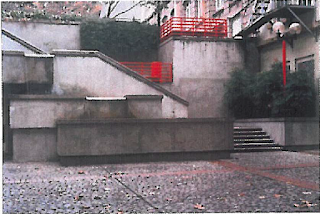 That year, Council voted to protect the memorial in perpetuity with Mayor Len Brown calling it a “national treasure” - and an additional staircase was built in an unused section of the wall in Upper Khartoum Place to improve access to the Art Gallery. Ref: Jay Farnworth, Staircase in Khartoum Place, 10 September 2014, Auckland Council, 38-279153.